Photo of the Month This morning I drove down to Potter Marsh for the swans and some mist amongst them. Instead I found this morning munching moose family on the flats on the west side … Families should eat together more often, don’t you think? 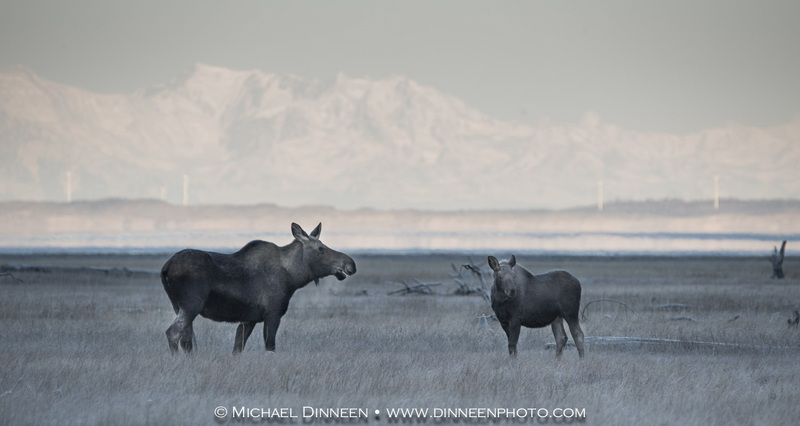 With the moose in shadow and the fully lit Fire Island and Alaska Range behind, I was hoping for the first rays of direct sun before they left, but it was not to be… the trick here was to balancing the shade with the background. Bracketing my exposures helped compensate the difference in light values.